Karol Wojtyla becomes the first Polish Pope in 1978. Solidarity, a free and independent trade union, is born in the strike at the shipyard in Gdansk in August 1980. Lech Walesa becomes its leader. On 13 December 1981 General Jaruzelski, Polish Head of State, declares a State of War. Marital law is imposed, Solidarity leaders and activists are interned. 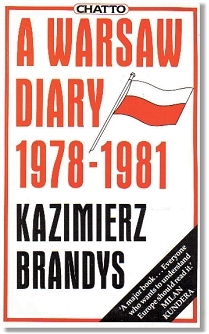 Kazimierz Brandys records what it felt like to live through these events in a communist police state. Julek S. tells of the anniversary ceremonies at the Tomb of the Unknown Soldier, where thousands of people had come together (the police were out of sight, hidden in side streets). Thousands sang "Oh God, Who So Long Has Protected Poland"
On the day Karol Wojtyla's election to the papacy was announced people ran through the streets of Warsaw shouting with joy. A tearful old man [said] "Did you hear? It's a miracle! A miracle!" The government is to introduce into the Sejm the draft of a bill calling for martial law. Solidarity has issued a standby call for a general strike...threats and lies continue to pour from the television...What is hidden behind those dark glasses [of General Jaruzelski] - Poland or Russia? Publisher - Published by Chatto and Windus in 1984. R Z Sheppard, Time (US) 9 January 1984, wrote in To Be or Not To Be. The nature of his diary precludes dramatic narrative and the delineation of character. One learns obliquely of the "Flying University," a scholarly group of dissidents who meet in various locations; of NOWA, the independent publishing house that challenges the censors; of K.O.R. (Workers Defense Committee) and its support of Solidarity; and of the thaws and sudden freezes that characterize government policy. Brandys' strengths are not those of an eyewitness; much of what he describes is second-and thirdhand. He even turned down a ticket for a seat at John Paul's Warsaw Mass and watched the event on television. Instead, he is a moral witness. Kazimierz Brandys died in Paris on 11 March 2000. Kazimierz Brandys, 83, an emigre Polish writer who once glorified socialist ideology but later disparaged Communism with stark portrayals of life behind the Iron Curtain... His 1946 book, “The Rebellious City,” a dramatic novel about Warsaw’s struggle under the Nazis, won him trust and popularity among Poland’s new leaders, and he became prominent in the ranks of the Communist-supported school of socialist realism...Brandys’ later fame in Poland stemmed from his compelling portrayals of everyday life in essays and diaries...Brandys went into self-imposed exile in Paris after the martial-law crackdown against the Solidarity trade union movement in 1981. This page was added on 20 July 2008.